For fans hoping to see Israelis in action at the U.S. Open tennis tournament this year, the key was to show up a week early. Three of the five Israelis hoping to compete in the main draw were out before the tournament even started. 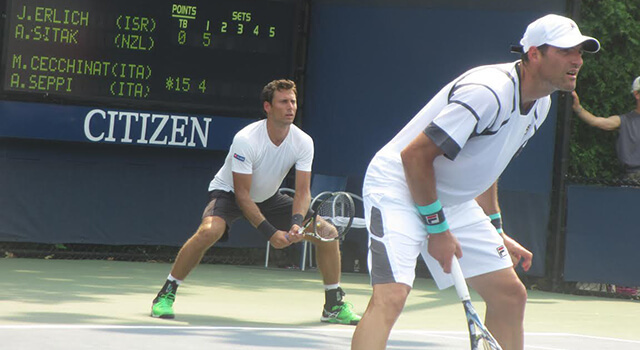 Shahar Peer, Julia Glushko and Amir Weintraub competed in the US Open Qualifying Tournament, which took place at the USTA Billie Jean King National Tennis Center in Queens, N.Y. August 25-28. Players ranked from approximately 105 to 250 in the world entered a 128, player men’s and women’s draw. More than 30,000 spectators attended the free week-long event. The 16 men and women who win three straight matches enter the main draw of the U.S. Open, which kicked off on August 31 and will run through Sept. 13. More than 700,000 tennis fans watch the top men’s and women’s players from around the world compete for a staggering $42,253,400 in prize money. Peer lost in the first round of the qualifiers to Tamira Paszek of Austria 6-2, 6-3. Amir Weintraub lost in the first round to Guilherme Cezar of Brazil 3-6, 6-4, 6-3. Julia Glushko won her first round match to American Julia Boserup 4-6, 6-3, 6-1, but lost in the second round to Jelena Ostapenko of Latvia, 2-6, 6-0, 6-4. The last remaining Israeli in the Open, Jonathan “Yoni” Ehrlich, played doubles with new partner Artem Sitak of New Zealand. Erlich is perhaps best known as half of the championship team of “Andyoni.” His partner, Andy Ram, 35, retired last year after the two won their five-set doubles match versus Argentina in the Davis Cup in Sunrise, Fla. last September. Ram is currently co-founder and CEO of Pulse Play, a company that produces smart watches for tennis and other racket sports. Erlich and Sitak lost their first round match to the Italian doubles team of Marco Cecchinato and Andres Seppi, 6-7, 6-3, 7-6. Erlich, returning from recent knee surgery and illness, was disappointed with the loss, saying, “I thought we would go further. We played decent but didn’t take it.” Erlich will return home to Israel to spend time with his children, 7 and 3. One Jewish player of note in the Open’s main draw is Diego Schwartzman, 23, of Argentina. Following a first round win, he battled Rafael Nadal, the 8th seed, for nearly three hours, eventually losing 7-6, 6-3, 7-5. Schwartzman also lost in the second round of the men’s doubles. Once again, the tournament offered kosher food from Kosher Grill, a food stand just off the main food court. The stand is under kosher supervision and is closed on Shabbat. The Katz operates kosher food stands at many sports stadiums and arenas and has provided kosher food at the Super Bowl.